Just realized I haven’t posted anything after my supposed second chance at meeting Suk upclose. Been more than two weeks and I still remember the events vividly. Actually I enjoyed the second show more than the first one maybe because my seat was closer to the stage so I had a better view of the play and could see every detail presented to the audience. I say this again, Suk is so brilliant and amazing playing Mozart. He surprises with every performance and just never ceases to impress me and I guess, every one of us. Well...I mentioned “supposed” earlier because unfortunately I didn’t get to see him upclose a second time. He didn't come out after the show which surprised me coz he didn't have two shows the following day. Anyway, he really didn't need a reason. It must have been just, again a case of bad timing for me. Remember in the fan meetings when I failed to see him upclose too? Wrong place, wrong time in both occasion. I may be his unluckiest fangirl. Haha! But..still I feel blessed because at least I got to see him once. Not every fan will have that opportunity. That one encounter I will forever cherish in my memory and in my heart. So happy that many fans are watching him perform and that they are given that rare chance to meet him personally after the show. I wish him the best! According to this article, "Amadeus" has been the No.1 bestselling work on Interpark for 7 consecutive weeks with ticket sales at 93% seats. It's expected to exceed 58,000 spectators at the end of this month! JO Jung-suk and Yoon-a will star in a disaster-action movie. “Genius chameleon actor JO Jung-suk and Yoon-a, rising actresses of Confidential Assignment (2017), are cast for EXIT (working title)”, announced the production company Filmmaker R & K and the distributor CJ Entertainment. The disaster-action thriller will be co-produced with Film K by Filmmaker R & K, which has put out The Berlin File (2013), Veteran(2015) and The Battleship Island (2017). The director is LEE Sang-geun, who received the Jury Special Award for his short film Mr. Tap’s Holiday (2010) at the Mise-en-Scène Short Film Festival (MSFF). “LEE is a graduate of the Korea National University of Arts and has been working in films for a long time. We are expecting this young director to make a bright and witty movie“, said CJ Entertainment. The movie tells the story of Yong-nam (JO Jung-suk) who comes across a former fellow college student, Eui-joo (Yoon-a). The two try to escape a catastrophic situation where the city gets enveloped in a mysterious toxic gas. The pre-production is finished, and the filming will start this year with an expected release in Summer 2019. Already missing him a lot. Hope he comebacks with a drama soon. I miss him too...a lot!!! Been a while since my last post and I know I keep saying how much I hope fans keep this thread alive but I myself don't even post often. Huhu.... Haven't heard from him in a while and news of Drug King being moved to a winter release makes the wait even more agonizing. I pray that we won't wait till winter to see him again. Hope he releases a new cf or schedules a fansigning event at least or maybe do the ice bucket challenge again. Someone please nominate him. Ahaha. He needs real ice this time. The last one he did, I didn't see ice. Maybe it melted. Lol. I hope everything is going well with him these days. He's always included in my prayers every single time. I will always be here to support him and though I was frustrated a few times (not with him but with my bad timing lol) I realize how much his existence, the fact that he is out there sharing his talent to the world is already a privilege and is a source of happiness to me and to his many fans. So there really is nothing to be frustrated about. I actually feel so lucky to have met him and can live the rest of my life with that memory alone. Awww. Sorry. I'm being sentimental again. Lol. I just truly, absolutely miss our dear Suk. He must be really busy filming his movies these days. It‘s a surprise in the morning actually.. and all the fans account in IG showing all the news.. oh wow! Hiii @mundaliv Yeah.. what a suprise in the morning. I have mixed feeling about having to send him off..., but mostly I'm happy for him! Jo Jung Suk and Girls’ Generation’s YoonA have begun filming their new action movie! “Exit” is a new style of disaster-action film about a young, unemployed man Yong Nam (played by Jo Jung Suk), who coincidentally runs into a junior from his college club Eui Joo (played by YoonA). They escape from downtown as it becomes enveloped in poisonous gas. 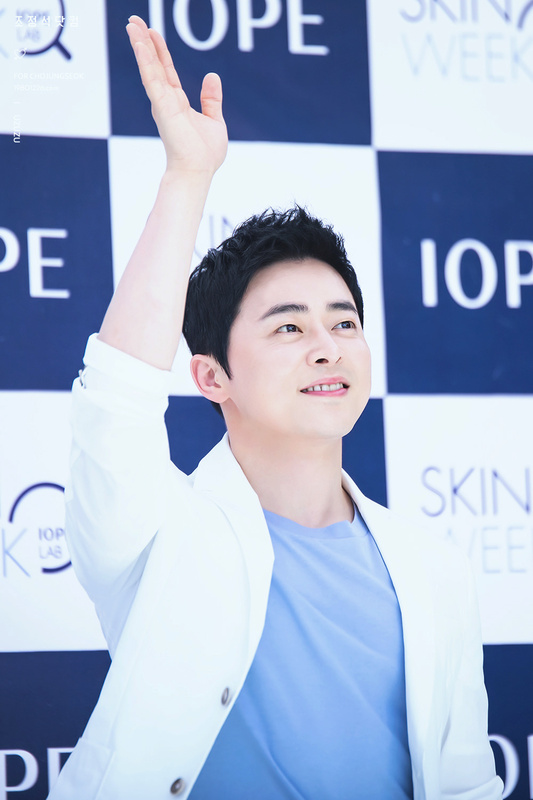 Jo Jung Suk will be taking on the role of Yong Nam, who is criticized by his family for continuously failing to find a job. YoonA will be playing Eui Joo, the deputy branch manager of the convention hall where Yong Nam’s mother’s 70th birthday party takes place. After coincidentally running into Yong Nam, she is thrown into chaos before she can even reminisce about her college years with him. The film also boasts a star-studded cast of veteran actors. Go Doo Shimand Park In Hwan play Yong Nam’s reliable mother and impatient father. Kim Ji Young will be taking on the role of Yong Nam’s fierce older sister Jung Hyun. “Exit” will be director Lee Sang Geun’s film debut, after receiving a lot of attention at the Mise-en-scène Short Film Festival. It will be wrapping up filming in the latter half of the year and is slated to air in summer of 2019. The film also boasts a star-studded cast of veteran actors. Go Doo Shimand Park In Hwan play Yong Nam’s reliable mother and impatient father. Kang Ki Young will be taking on the role of Yong Nam’s fierce older sister Jung Hyun. Cannot stop smiling! Jo Jung Suk is going to cameo in Han Ji Min & Ji Sung's drama: Familiar Wife!! Look out for him!